English Learners in K-12 Education: What Does the Research Tell Us? Recently, we released the 2017 English Learner Education Report, which examines the state of K-12 English Learner (EL) instruction in the U.S.
Children embarking on the journey of mastering a new language are to be celebrated, and the best way to do that is to empower them with the very best instruction - that, in turn, allows them to be successful both in and out of the classroom. In order to provide ELs with the best learning experiences and resources, it’s important to have a holistic understanding of the state of EL education in the United States — including how EL instruction is being prioritized in school districts, the types of resources being used to support ELs and how educators generally feel about the effectiveness of EL instruction. Teacher support has the greatest in-school impact on EL student success. 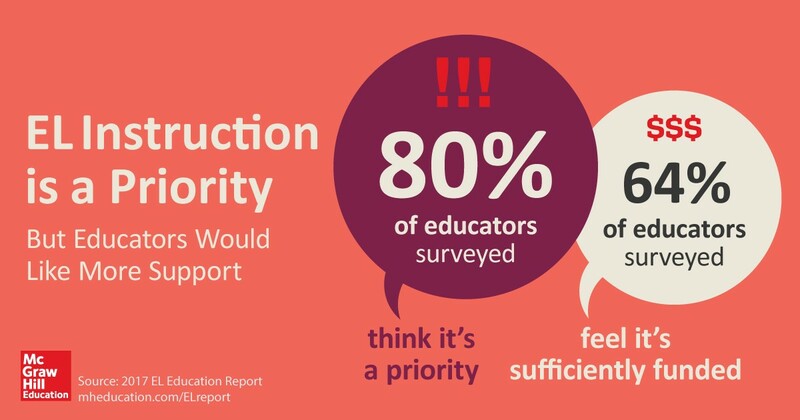 Ninety-three percent of respondents believe that teacher support is very or extremely impactful on EL student success, outpacing both school support (84 percent) and district support (69 percent). 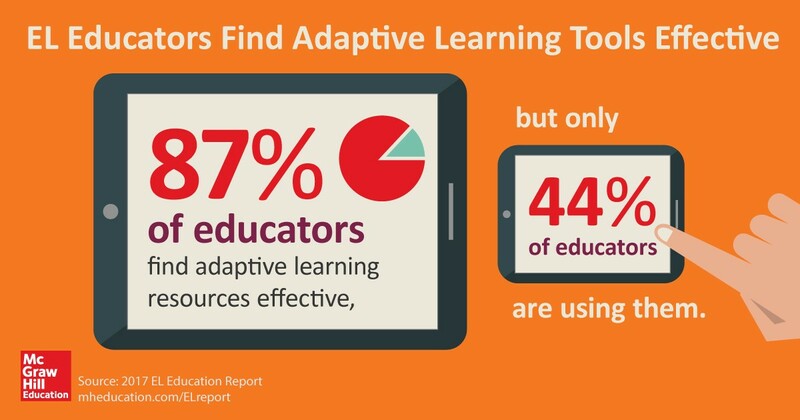 Respondents consider digital resources and adaptive learning technologies to be among the most effective tools for EL instruction. Digital learning materials, such as video and audio resources, and adaptive learning technologies, are considered highly effective (by 92 percent and 87 percent of respondents, respectively), whereas other materials, such as printed workbooks and textbooks, are considered less effective (by 67 percent and 61 percent of respondents, respectively). Customized and personalized learning materials can serve as valuable resources when looking to meet the diverse cultural and educational backgrounds of EL students. Diverse student needs are a commonly mentioned challenge of EL instruction, as EL students are diverse, not only in the languages they speak, but in their overall educational and English backgrounds. As a result, standardized, one-size-fits-all programs are not always the most effective for many EL educators. It is therefore not surprising that many EL educators frequently curate and customize their learning materials. Respondents are optimistic about the continued academic performance of EL students in their schools or districts. Eighty-nine percent of respondents are optimistic regarding the continued improvement in academic performance of EL students at their school or district. 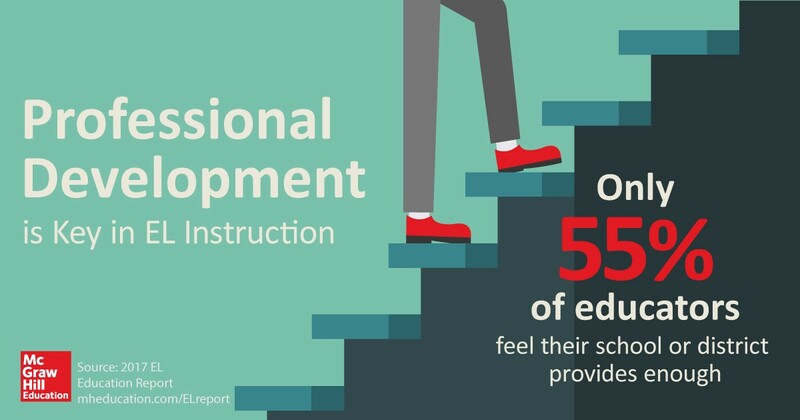 Respondents are less optimistic that EL instruction is helping students become career or college ready (84 percent and 79 percent, respectively).